Writing a global illumination renderer takes one hour. Starting from scratch. Writing an efficient and general global illumination renderer, takes ten years. When doing computer graphics as an aficionado rather than a professional, the "efficient" and "general" aspect can be dropped from your implementations. Which means you can indeed write a full global illumination renderer in one hour. Also, given the power of the hardware these days, even if you don't do any clever optimizations or algorithms, a global illumination system can render in a mater of seconds or even realtime. 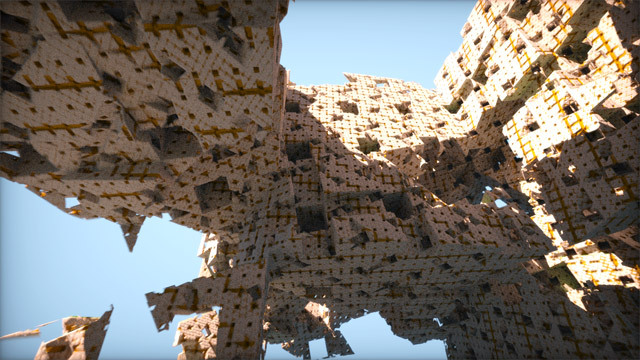 For those of us who wasted hours and hours waiting to get a simple 2D low resolution basic fractal rendered back in the early 90s, todays brute-force raw power of machines seems pretty astonishing. In my opinion, the main advantage of fast hardware is not that the graphics get rendered quicker, but that clever algorithms are not that necessary anymore, meaning that straight away approaches (those which are actually the most intuitive of all) can be directly coded and a result can be expected in a reasonable amount of time. 20 years ago expensive techniques required the implementation of clever, complex and obscure algorithms, making the entry level for the computer graphcis hobbyist much higher. But thanks to new hardware that's not true anymore - today, writing a global illumination renderer takes one hour at most. This is indeed a regular direct lighting renderer, as used in most intros, demos and games. Note that when rendering with rays, it all starts by iterating the pixels of the screen. So if you are writing a CPU tracer, you probably want to do this by spliting the screen in tiles of say, 32x32 pixels, and by consuming the tiles by a pool of threads that contain as many threads as cores you have. You can see code that does that here. If you are in the GPU, like in a fragment shader or a compute shader, then that work is done for you. Either case, we have a function calcPixelColor() that needs to compute the color of a pixel given its coordinates in screen and a scene description (the scene description is given by the functions above). The sun is a disk, and the sky is a dome. Note how the sky light doesn't compute the usual diffuse "N dot L" factor. Instead, the code replaces the uniform sampling of the sky dome with a cosine distribution based sampling, which sends more samples in the direcion of the normal and less to the sides proportionally to the cosine term, therefore achieving the same effect while casting far less rays (you have probably heard the word "importance sampling" before). In this case the function is 80% diffuse and 20% glossy (with a glossiness cone angle of 0.9 radians).